Learning how to broil filet mignon is a staple of gourmet cooking. A little preparation can make the task delightfully simple. Broiling is a cooking method that uses high heat for a short duration.This approach is popular in creating low-fat meals as well as for cooking meat quickly. Broiling filets is similar to grilling filet mignon because both methods use high heat to sear the meat while locking in juices. Broiling methods include stovetop cooking with dry heat and oven cooking but broiling filet mignon in the oven is more common. Learning how to cook filet mignon in a broiler includes supplies, ingredients and method. The ingredients are very simple. Rub the filets with extra virgin olive oil and season with salt and pepper to taste. Some may suggest using pats of butter for extra flavor but the fat in the butter may burn, creating an unappetizing crust. The idea of broiling is to sear in the meat's natural juices and flavor so very little seasoning is necessary. Ideally, the filets are fresh and no thawing is necessary. If cooking frozen filets, make sure to allow the steaks to thaw overnight in the refrigerator for the best results. Microwaving the steaks may make them tough and this approach is not recommended. The oven rack should be about six or seven inches away from the heating element in the broiler. Preheat the cast iron skillet for about 20 minutes before searing the steaks. Rub the steaks with extra virgin olive oil, salt and pepper. Sear the steaks in the hot skillet for about three minutes on each side. After searing in the juices and flavor, broil the steaks at 500 degrees Fahrenheit until they reach the desired doneness. An integral part of learning how to broil filet mignon is determining cooking time. The time the steaks are allowed to broil depends on a number of factors, primarily how well done you would like the filets to be. Rare steaks are cooked to between 120 and 130 degrees Fahrenheit. They are dark pink to red in the center and slightly warm. This level of doneness yields a steak that is soft, juicy and succulent. Medium rare steaks are succulent and juicy, representing a gradient between rare and medium doneness, cooked between 130 and 140 degrees Fahrenheit. If someone asks for a steak done "medium rare", cook closer to medium; if someone asks for "rare-to-medium", cook closer to rare. Medium steaks are cooked to between 140 and 150 degrees Fahrenheit and they are warm and grayish pink in the center. A band of pink typically runs through the steak. This degree of doneness yields a firm, juicy filet. Medium well steaks are cooked between 150 and 160 degrees Fahrenheit and they are grayish brown throughout with a hint of pale pink in the center. This degree of doneness yields a chewier piece of filet with slight juiciness. 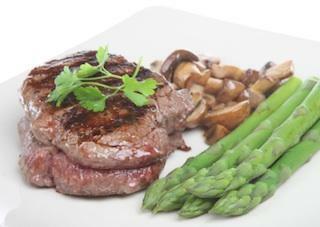 In order to get the desired results, it is necessary to choose the right cooking time for filets. As a general rule, filets take about one minute less to cook than other cuts of meat. Time broiling after searing the steaks process for optimal results.